Located at an altitude of 15,250 feet, the Rupin Pass is one of the most popular trekking destinations in the Indian Himalayas. With breathtaking views of the entire Kinner Kailash Mountain Range, the trail to Rupin Pass leads you through several Himachali villages populated by local shepherds and farmers. Populated with brightly coloured flowers and vast expanses of lush grasslands, your campsites are located at scenic locations under star-studded Himalayan skies. As the trail cross from Uttarakhand and into Himachal Pradesh, you may also need to hike through patches of deep snow. • Trek up to an altitude of 15,250 ft to reach the Rupin Pass. • Trek through thick snow on your way to Rupin Pass. • Stay in tents pitched at scenic campsites. • Catch breathtaking views of the Himalayas. 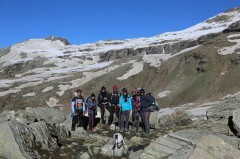 Travellers are required to adhere to the instructions of the trip leader/tour guide during the trek to Rupin Pass. For cancellations made more than 24 days before departure of the Rupin Pass trek: 95% refund. For cancellations made between 14 to 24 days before departure of the Rupin Pass trek: 70% refund. 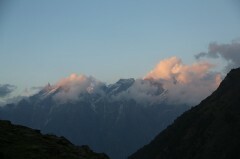 For cancellations made between 13 to 8 days before departure of the Rupin Pass trek: 50% refund. For cancellations made less than 8 days before departure of the Rupin Pass trek: No refund. The tour operator takes utmost care to ensure safety of the travellers and shall not be held responsible for any mishap, accident or loss of life during the trek to Rupin Pass. 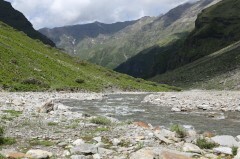 Transport from Dehradun to Dhaula is not included in the Rupin Pass trek. Transport options can be arranged at an additional cost of INR 6,000, shared by all passengers. There is no pick-up for this trek. There is no drop-off for this trek. Arrive at Dhaula in the evening. From the Dehradun Railway station, it's a beautiful 8 hour drive that will take you by rivers, valleys and small towns such as Purola and Mori. Overnight at Dhaula in home stay. Trekking through pebbled pathes and waterbodies. Wake up early and embark on your first trek of the trip to Sewa. 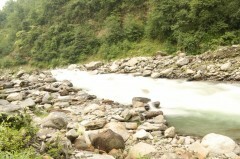 Along the way, you will get spectacular views of the Rupin River that flows parallel to your trekking route. The route also passes through apple and apricot orchards and ends at Sewa. Reach Sewa by evening. Overnight at Sewa in home stay. Trekkers stopping for a picture. After having a restful night's sleep, today's trek to Jhaka will be a notch above your previous day's trek. Begin by crossing a wooden bridge marking your entry into Himachal Pradesh from Uttarakhand. You will pass the villages of Kwar and Jiksun and continue towards Jhaka. Patches of the trail require you to be careful as it will lead you through narrow walkways cut into mountain edges and surrounded by dense forests. Overnight at Jhaka in home stay. Catch these stunning views during your trek. Today's trek will take you to Saruwas Thach. It is a scenic route that passes through streams, snowy patches and bushes of rhododendron flowers. Crossing a few giant boulders, you will reach a 'U' shaped valley with a waterfall. Set up camp here to spend the night in tents. Overnight at Saruwas Thach in tents. Today, you will begin trekking towards Dhanderas Thach. Trail through forests lined with silver birch, pine and oak trees and cross small river streams and waterfalls. You will reach Dhanderas Thach by evening. Overnight at Dhanderas Thach in tents. Before you begin trekking, you will have a short briefing session to learn the basic skills of trekking through snow. You will encounter patches of deep snow on the short trail to the Upper Waterfall camp. Trek through a snow bridge followed by a steep climb to reach your campsite. Overnight at Upper Waterfall Camp in tents. Today, you'll climb up to the highest and most awaited point of this trek, the Rupin Pass. Begin on your trail through patches of thick snow. As you make your way up, you can catch increasingly breathtaking views of the lower Himalayas. Once you reach the Rupin Pass, spend some time admiring its scenic beauty and head down towards Ronti Gad. Overnight at Ronti Gad in tents. Embark on a long downhill trek from Ronti Gad to Sangla. Starting with a small ascent followed by a sharp descent, you will pass several vantage points that offer clear views of the entire Kinner Kailash mountain range and the Sangla Kanda Lake. You will reach Sangla by late afternoon. Your trip ends here. Overnight at Dhaula in home stay. You will be accommodated at a home stay on a triple/multi-sharing basis. Clean beds and linen will be provided for a restful night's sleep. Today's meal package includes dinner upon arrival at Dhaula. Outside views of the camp tents. Overnight at Sewa in home stay. You will be accommodated at a home stay on a triple/multi-sharing basis. Clean beds and linen will be provided for a restful night's sleep. Today's meal package includes breakfast, lunch and dinner. Overnight at Jhaka in home stay. 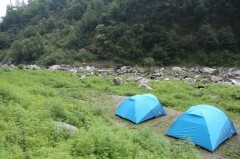 Overnight at Saruwas Thach in tents. You will be accommodated at in tents on a triple/multi-sharing basis. Clean sleeping bags and mattresses will be provided for a restful night's sleep. The campsite will be equipped with common kitchen/dining and toilet tents. Today's meal package includes breakfast, lunch and dinner. Overnight at Dhanderas Thach in tents. 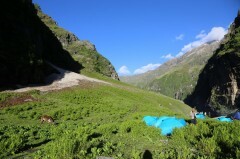 Overnight at Upper Waterfall camp in tents. Overnight at Ronti Gad in tents. Today's meal package includes breakfast before departure from Ronti Gad. Dhaula can be reached by boarding a flight to Dehradun's Jolly Grant Airport or train to Dehradun Railway Station. Private vehicles can be rented to reach Dhaula from Dehradun.